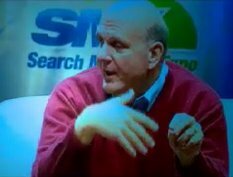 Watch Microsoft CEO Steve Ballmer live at SMX. He is currently talking about how Microsoft fits in with the current search market and how their relationship will develop with Yahoo. Mr. Ballmer also talks about the legal issues of how Google goes about their advertising online business. Specifically, he points out that Google is breaking the laws that regulators have established as right and wrong. Most interesting is to listen to Steve Ballmer talk about China, and how anyone who wants to be competitive must partner with Baidu.